Is this painting happy or sad? What do you think? Have students look at the colors, the way the people and things in the painting are arranged, and their imagination to picture the mood of the people in the room. Artists tell stories with color, line, and shape. They paint people, places, and things. They even paint numbers and counting, if you look closely enough. You'll find all these things in Interior, a small painting by African-American artist Horace Pippin. Horace Pippin was an African-American painter. He was born around 1888—just twenty-three years after the Civil War and the end of slavery. His grandparents were slaves, and his parents were domestic workers. Pippin liked to draw and would illustrate his spelling words in school. But his family could not afford art materials. At age ten, he won a box of crayons in a magazine drawing contest and started coloring. He left school at age fourteen to help his family. He worked on a farm, as a porter at a hotel, and as an iron molder in a factory. In 1917, Pippin went to France to fight in World War I. His right arm was badly injured in the war. He returned home, married, and settled in Pennsylvania. Because of his injury, he worked odd jobs and barely made a living. At the age of forty Pippin found a way—even with his crippled right hand—to draw on wood using a hot poker. He made many burnt-wood art panels. Pippin decided to try painting with oil. He used his "good" left hand to guide his crippled right hand, which held the paintbrush, across the canvas. It took him three years to finish his first painting. Pippin went on to paint his memories of soldiers and war, and scenes from his childhood. He said, "The pictures . . . come to me in my mind and if to me it is a worthwhile picture I paint it . . . I do over the picture several times in my mind and when I am ready to paint it I have all the details I need." He also painted historical subjects, such as Abraham Lincoln and John Brown, and scenes from the Bible. At first, he made only about four paintings per year. oil on fabric, 24 x 30 in. Pippin was called a folk artist because he had no formal art training. He used bright colors, flat shapes, and straight lines. He did not use shading or complicated perspective. His art is also called primitive, naive, or innocent. In 1938, when he was around 50, the Museum of Modern Art included four of Pippin's paintings in a traveling museum show. He took art classes for the first time. Pippin became more and more well known. Galleries showed his paintings, and museums began to buy his work. He made 75 paintings during the last years of his life. Just as he became famous, Pippin died. 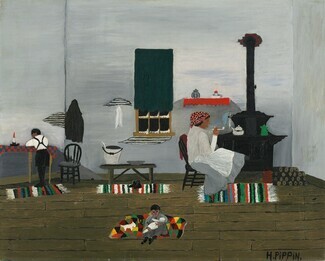 Pippin painted this interior scene—the inside of a house—from his childhood memories. He said, "Pictures just come to my mind and I tell my heart to go ahead." Interior's "Secret Number": What number can you find again and again in Interior? Count the cracks in the walls. Now have students count by threes. Can they make it to 30? Give each person a name. Include what they see in the painting, then use their imaginations to write what will happen next in the story. Give their story a new title—not Interior. Sign their name on the back and contribute their story to a class book of Interior stories. Pick one room to draw. Include people, furniture, toys, and decorations. For example, for number four, you could include four books, four pets, and four windows, along with any number of other objects and people. Keep your painting simple. Use only three or four colors. Fill the whole paper with the wall and floor of your room. Set the objects within the space. Trade paintings with a partner when they are finished. Start counting! Can you figure out your partner's secret number? Did your partner figure out yours? Put your painting in a class counting exhibit. Can you figure out the secret numbers in all the paintings? VA:Cr1.1.2 Brainstorm collaboratively multiple approaches to an art or design problem. VA:Cr2.1.2 Experiment with various materials and tools to explore personal interests in a work of art or design. VA:Pr4.1.2 Categorize artwork based on a theme or concept for an exhibit.